A lattice of 3D printed nickel. The entire structure is printed in 150nm layers and the final structure is 6µm high. Image: Greer Lab. For the first time, it is now possible to create complex nanoscale metal structures using 3D printing, thanks to a new technique developed by scientists at the California Institute of Technology (Caltech). The process, once scaled up, could be used for a wide variety of applications, from building tiny medical implants to creating 3D logic circuits on computer chips to engineering ultralightweight aircraft components. It also opens the door to the creation of a new class of materials with unusual properties based on their internal structure. The technique is reported in a paper in Nature Communications. In 3D printing – also known as additive manufacturing – an object is built up layer-by-layer, allowing for the creation of structures that would be impossible to manufacture by conventional subtractive methods such as etching or milling. Caltech materials scientist Julia Greer is a pioneer in the creation of ultra-tiny 3D architectures built via additive manufacturing. She and her team have built 3D lattices with beams just nanometers across – far too small to be seen with the naked eye. These materials exhibit unusual, often surprising properties; for example, Greer's team has created exceptionally lightweight ceramics that spring back to their original shape, sponge-like, after being compressed. Greer's group 3D prints structures out of a variety of materials, from ceramics to organic compounds. Metals, however, have proved difficult to print, especially when trying to create structures with dimensions smaller than around 50µm, or about half the width of a human hair. To conduct 3D printing at the nanoscale, Greer’s group uses a high-precision laser to zap a liquid material in specific locations with just two photons, or particles of light. This provides enough energy to harden liquid polymers into solids, but not enough to fuse metal. Greer's graduate student Andrey Vyatskikh came up with a solution. He used organic ligands – molecules that bond to metal – to create a printable resin comprising mostly polymer but which carries a metal along with it. In the experiment described in the Nature Communications paper, Vyatskikh bonded together nickel and organic molecules to create a liquid that looks a lot like cough syrup. He and the rest of Greer’s group then designed a structure using computer software and built it by zapping the liquid with a two-photon laser. The laser creates stronger chemical bonds between the organic molecules, hardening them into building blocks for the structure. Since those molecules are also bonded to the nickel atoms, the nickel becomes incorporated into the structure. In this way, the group was able to print a 3D structure that was a blend of metal ions and non-metal, organic molecules. Vyatskikh then put the structure into an oven and slowly heated it up to 1000°C (around 1800°F) in a vacuum chamber. This temperature is well below the melting point of nickel (1455°C, or about 2650°F), but is hot enough to vaporize the organic materials in the structure, leaving behind the metal. The heating process, known as pyrolysis, also fused the metal particles together. In addition, because the process vaporized a significant amount of the structure's material, its dimensions shrank by 80%, while maintaining its shape and proportions. "That final shrinkage is a big part of why we're able to get structures to be so small," explains Vyatskikh. "In the structure we built for the paper, the diameter of the metal beams in the printed part is roughly 1/1000th the size of the tip of a sewing needle." Greer and Vyatskikh are still refining their technique. At the moment, the structure reported in their paper includes some voids left behind by the vaporized organic materials, as well as some minor impurities. Also, if the technique is to be of use to industry, it will need to be scaled up to produce much more material, says Greer. Although they started with nickel, the scientists are interested in expanding to other metals that are commonly used in industry but are challenging or impossible to fabricate into small 3D shapes, such as tungsten and titanium. 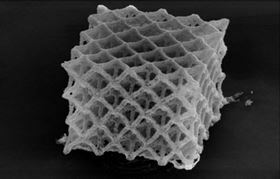 Greer and Vyatskikh are also looking to use this process to 3D print other materials, both common and exotic, such as ceramics, semiconductors and piezoelectric materials (materials with electrical effects that result from mechanical stresses). This story is adapted from material from Caltech, with editorial changes made by Materials Today. The views expressed in this article do not necessarily represent those of Elsevier. Link to original source.